Guten Tag! If you’re after watching German Netflix in the UK then you’ve come to the right place. In this guide I’m going to show you the really easy way you can access German Netflix in the UK. But not only that, this guide is also suitable if you’re travelling anywhere else in the world. Admittedly my high-school German isn’t very good and I was planning on greeting you with more than simply “Guten Tag”. Let’s not waste time though, I’m sure you’re itching to watch German Netflix in the UK. For this, you’ll need a ‘VPN‘ app. A VPN allows you to change your online location to Germany. 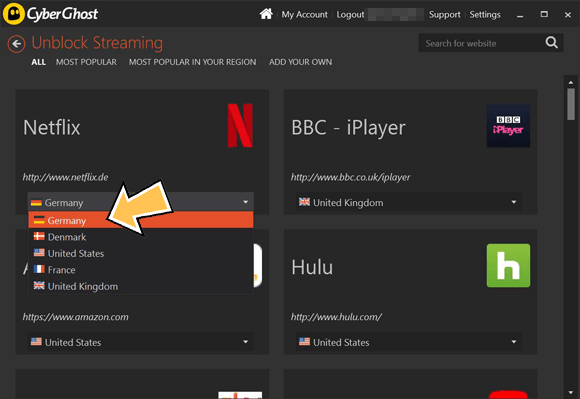 Below I’ll show you where you can get a VPN and how easy it is to use to watch German Netflix in the UK. Don’t worry meinen freunden (I told you my high-school German was bad) it’s actually really easy to watch German Netflix in the UK. For this, you’ll need a simple app called a VPN. A VPN allows you to mask your real location and make it look to any websites or apps that you’re in Germany. There are hundreds of companies selling VPN services and it can be difficult to choose. It’s important to note that not all work with German Netflix. To watch German Netflix in the UK you’ll need to sign up to CyberGhost VPN. They’re one of the most popular and easy to use VPN services and the only one I could find working with German Netflix. In fact, their app has a dedicated mode to watch German Netflix. Below I’ve put the steps you’ll need to take to sign up and watch German Netflix in the UK and elsewhere in the world. To watch German Netflix in the UK you should follow the steps below. They’re beginner friendly and will take you under 5 minutes to complete. Visit the CyberGhost VPN website and click Get CyberGhost VPN, then follow the sign-up process. Download the app for your device either from your usual app store or the CyberGhost VPN website. Next open the app and when required login with your account details. On the app press ‘Unblock Streaming‘. Then press the large ‘Play‘ or ‘Connect‘ button. Now you’re connected to the CyberGhost VPN app you should visit the Netflix website or use their app like normal. Rather than getting the UK Netflix service or whatever other country you’re in, you’ll now have access to the German Netflix service. This means you can watch German specific movies and TV shows and access more German audio and subtitles. This works on the majority of devices that CyberGhost VPN support, from Windows computers to Android tablets and from iOS phones to Amazon Fire TV Stick devices. Check out the CyberGhost VPN website for a full list of supported devices. When you finish watching simply disconnect and reconnect when you want to watch again. There are no limits. You’re probably wondering if VPN apps are legal and it’s a good question. You’ll be pleased to know that VPN apps are entirely legal and their intended purpose is to protect your online privacy. Part of how it does this is by allowing you to disguise your location. When you use the CyberGhost VPN app to disguise your location you appear in Germany (or it can be any other country). This means Netflix thinks you’re in Germany and so lets you access the German service. A VPN works by taking your internet connection and forwarding it to a different location first. If you’re in the UK and you visit the Netflix website or you use the Netflix app it knows your location. From this it then allows you to watch the UK Netflix service. A VPN takes your connection and forwards it to Germany first. 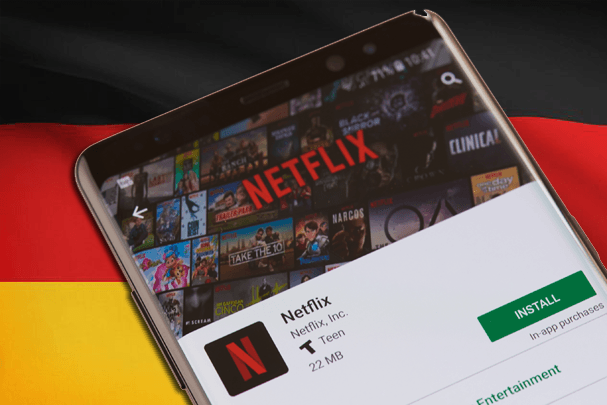 Any requests you make to access Netflix first go to Germany and then on to Netflix themselves. Netflix only see the German connection requesting their service. They then serve up the German Netflix service. The VPN app from CyberGhost VPN forwards this all back to you in the UK. It’s an automatic process and the app takes care of it all. You won’t even notice it happening. To watch German Netflix in the UK you’ll need to get a VPN app from CyberGhost VPN. You can do this by clicking the button below. Once you’re on the CyberGhost VPN website simply sign up for their service. When you’ve completed sign up you should download their app for your device. On the app use the Unblock Streaming and ‘Germany’ option from the Netflix section. You can then visit the Netflix website or use their app on any device to watch German Netflix in the UK. What have you been watching on German Netflix in the UK recently? I would love to know so please post in the comments section below.